50% downpayment should be paid in full before a subscriber can attend their first class..
Balance can be paid before the start of the fourth class. Payments for a subscription are non-refundable and non-transferable. Application should be made directly at PCCI’s office, located at 2247 Chino Roces Avenue, Makati City. Office is open from 9:00 a.m. to 6:00 p.m. (Monday to Friday). By appointment on Saturday and Sunday. Tel: 759-3087 or 892-5281. A valid government-issued ID is required upon registration. A PCCI Subscription ID will be issued to all subscribers. A subscriber who has taken courses equivalent to any of the diploma programs can convert them into a diploma program. The subscriber will then be required to submit the required project to receive a Diploma Program Certificate of Achievement. A subscriber has access to free refreshers for all classes that they have taken. A course is considered taken once the subscriber receives a Certificate for that class. Upon payment completion, the subscriber can register for their first class. Their last class should not go beyond one year from the start of the first class. The courses are held throughout the year. A subscriber can attend the classes within a period of one year from the start of their first class based on the posted calendar of classes per month. 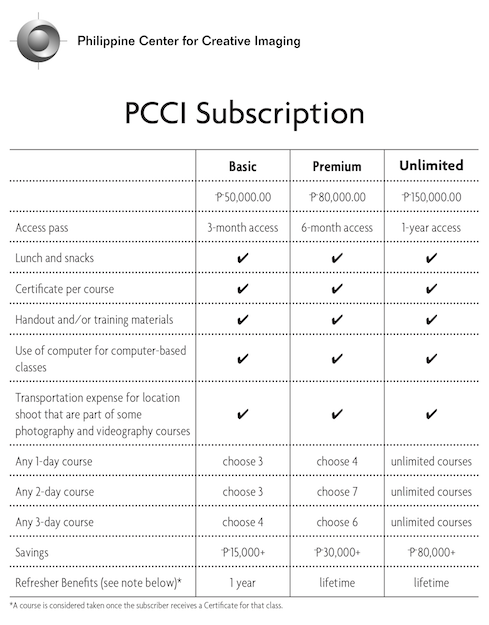 A subscriber can register in all PCCI regular classes including special classes and events. Classes offered by HFI, other PCCI partners, and classes not directly offered by PCCI are excluded from the the list of classes available to a subscriber. A subscriber must register beforehand in the class/classes that they want to attend. Seat allocation will be on a first-come, first-served basis. No walk-ins will be entertained. A subscriber must present their PCCI Subscription ID whenever they sign up for every class. Cancelling a class for which a subscriber has registered is not allowed on the day of the class itself. In the event that the subscriber cancels on the same day (or no show), the subscriber will have to pay P500 per class day the next time they sign up for the same course. If the subscriber once again cancels the rescheduled class, they will be paying the regular course fee should they decide to take the same course in the future. In the case of PCCI-initiated cancellation of a class, the subscriber has the right to register in another class within the subscription period. Includes materials, lunch and snacks during class days.